I am so excited! 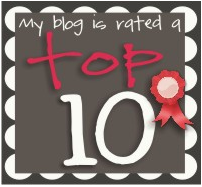 Two lovely blogs nominated me for the Top 10 Blog Award! Please go and visit Sprinkles to Kindergarten and Daisy Days for Learning and see their adorable blogs, with super cute ideas! Here are my nominations for this awesome award! Thank you SO MUCH for this award. I am sorry that it has taken me so long to get around to it but I just had my last day with my student teacher and have been SO SO busy! I am now following your cute blog!